We knew it was coming, and the day is finally here. The Federal Communications Commission published its ironically named new rules, the Restoring Internet Freedom Order, in the Federal Register on Thursday. It’s the end of the Internet as we know it. OK, maybe not right this minute. The effective date for most of the changes is April 23. There are some amendatory instructions that are contingent on approval of modified data-collection requirements by the Office of Management and Budget (which is directed by Donald Trump friend Mick Mulvaney), and the FCC will publish those in the Federal Register and announce their effective dates when that happens. The FCC’s summary of what it is doing. The FCC has summarized its actions by saying that it is returning to “the light-touch regulatory scheme that allowed and enabled the internet to develop and thrive for nearly two decades.” In a nutshell, the FCC has removed the Title II Order rules put in place by the Obama administration that classified internet service providers as “common carriers” and made them subject to regulation by the FCC. The FCC’s new rule classifies broadband internet access as a lightly regulated information service and classifies mobile broadband services as private mobile service. The plan is to make the Federal Trade Commission responsible for ensuring that ISPs don’t participate in anti-competitive internet practices. What’s wrong with the FCC’s new rules? The problem with the way the FCC is setting this up is that the door is now open for ISPs to be able to block, throttle and prioritize content as they see fit. The FTC won’t be able to pre-emptively stop them from doing this because there are no rules that say they can’t. The FTC will only be able to step in after the fact, and it will do so only if it finds that an ISP’s behavior is unfair or deceptive. An example of this at play. There are ways for ISPs to get around the “unfair” and “deceptive” thing. An example of this is AT&T, which offers its customers free streaming of DirecTV Now—its own service. As long as you are an AT&T Wireless customer, you won’t incur data charges while streaming DirecTV Now. Hulu is a competitor of DirecTV Now, and as such, Hulu loses out because if customers can stream with DirecTV Now for free, they are more likely to go with that than pay for a separate subscription to Hulu, which could also cost them data charges. That is essentially a prioritization of content already happening. So what’s next in the fight for an open internet? 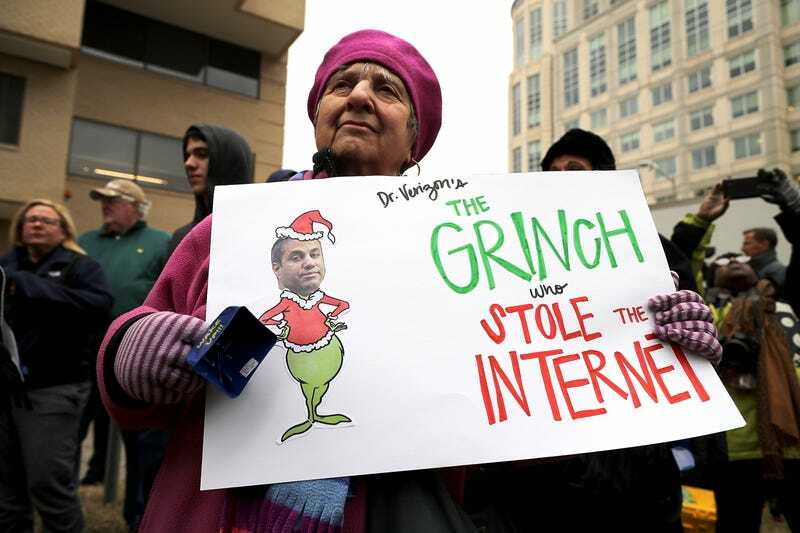 Now that the FCC’s new rules are officially on the books, it opens the door for states and advocacy groups to sue to stop the repeal from happening. The Senate is also working on a congressional reversal of the repeal. Twenty states plus the District of Columbia previously filed a petition to stop the repeal. Although those states withdrew their petition on Friday, a spokeswoman for New York Attorney General Eric Schneiderman—who is leading the charge—said that they will refile their petition when the final rules hit the books. “Either way, our coalition of AGs is taking the FCC to court to challenge its illegal rollback of net neutrality,” spokeswoman Amy Spitalnick said. This is likely to be a long battle, and one that will most certainly be a talking point during the 2018 midterm elections, so pay attention to where your government representatives stand on the issue. We must do all we can to protect the open internet.